Description of "The Bhagavad Gita Sanskrit Key"
The Aruna Sanskrit Language Series provides a variety of levels of assistance for a wide audience of people in introducing the Sanskrit language, deepening their understanding, and developing a practical knowledge of one of the greatest spiritual text in this language. 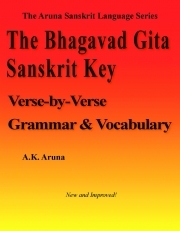 The fifth title in The Aruna Sanskrit Language Series is The Bhagavad Gita Sanskrit Key: Verse-by-Verse Grammar & Vocabulary. The Gita Key can be used as a quick answer key to the Aruna Coursebook exercises. By collecting the vocabularies of every verse together, this becomes a marvelous tool to study the grammar, syntax and meaning of the verses of the entire Bhagavad Gita. The Aruna Sanskrit Language Series was arranged for the following reasons. The Grammar Reference and the Aruna Coursebook are meant to stand together as an introduction to Sanskrit, without needing the other three books. If the student wants to proceed in this learning of the Bhagavad Gita, then minimally the Gita Key is also required. The Gita Dictionary was separated from the other books as it is more convenient to have a separate dictionary that can be opened as a reference for the Aruna Coursebook, Gita Reader, and Gita Key, or as a reference tool apart from this series. If one is not interested in learning Sanskrit grammar and can read the Sanskrit script, yet wants to know the Bhagavad Gita and how its meaning is arrived, then just the Gita Key will more or less suffice, though its thousands of grammar rule references require the Grammar Reference. If one simply wants a very good translation of the Bhagavad Gita and can read the Sanskrit script, then the Gita Reader is complete in itself. If you cannot read the Sanskrit script, but still want to see this same good translation, then see this author’s The Bhagavad Gita: Victory Over Grief and Death. It has the same English translation of the entire Bhagavad Gita within it, with the number of Sanskrit words, in transliteration, retained in the translations greatly reduced from the Gita Reader version. The The Bhagavad Gita Sanskrit Key - PDF Version. It costs much less and can be downloaded immediately. Being a searchable PDF it also can be an excellent companion to the print version for those who wish to quickly and easily search for any expression or word one wishes. Reviews of "The Bhagavad Gita Sanskrit Key"